If you are in Malaysia for a holiday, you may want to consider heading to Melaka to spend a few days to bask in the history of the nation. The state has been named the Historical State of Malaysia and is a great place to visit. Besides having amazing historical tourist destinations for those who love a trip down memory lane, Melaka is also home to some other tourist destinations that may interest you. The Crocodile Farm is one such tourist destination that has beckoned tourist to visit its residents since it opened in 1987. The farm has even expended its ground to play home to other types of reptiles. 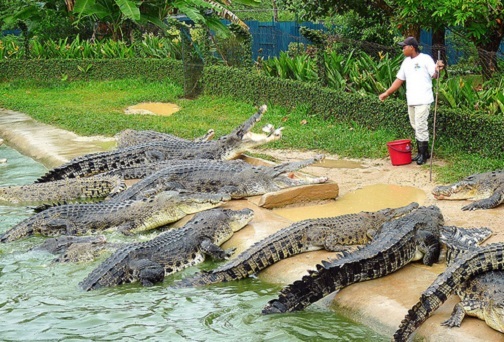 Crocodile lovers and those just looking for the thrill of getting up close with some of the world’s most dangerous creatures will definitely love it here at the Crocodile Farm. The entrance built like a mini fort with a flight of steps leading inside beckons tourist to view over 200 different crocodiles that hail from around the globe. To enter, minimal entrance fees are charged; adults pay RM 5 while children pay only RM 3. The park is also home to a water park and entrance fees for the water park are separate. A day at the crocodile farm is definitely worth the money spent. The park hosts shows that feature the farms popular crocodiles daily but at specific times of the day so do check with the schedule to be in time for an amazing Crocodile and Snake show. Before entering the farm where the crocodiles are kept, visitors are greeted by a huge replica of a crocodile; certainly a scary sight to behold. There are also replicas of famous monuments of the nation put on display here for visitors to view. It is also a great photo opportunity! The crocodiles stay in their enclosure and you can view them from a very near but safe distance. If you are lucky enough, you can see some of the crocodile eggs on the ground beside very protective mother crocodiles. The crocodiles can be seen lazing around in the sun; some with their mouths open. The large pond in the farm is also crowded with many crocodiles either silently hovering in the water or sun bathing at the brink of the pond. If you are lucky, you can see how the grounds keeper feeds the crocodiles; certainly a very interesting process that is carried out daily with the safety of the keeper in mind! For those looking for culture exploration and food trails. Also known as a backpacker paradise. A gateway to all the city attractions with wide range of accommodation options.